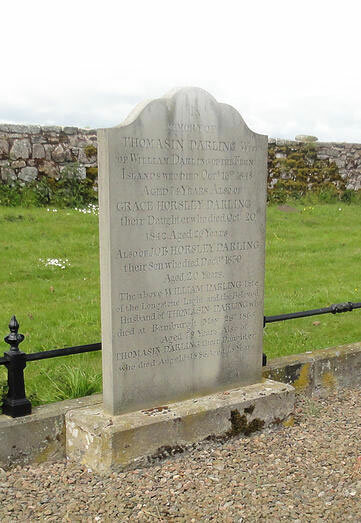 In the churchyard there is a prominent stone memorial to Grace Darling, with a carved full length figure. Many would assume she rests beneath this monument, but her grave is elsewhere. 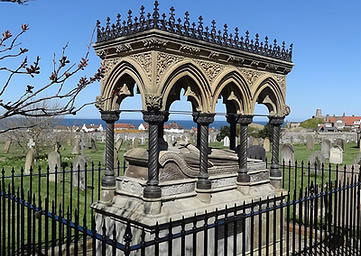 Grace Darling’s funeral took place on Monday 24 October 1842. Within a few days a notable Bamburgh resident gave £10 to initiate a fund for the construction of a memorial. Generous donations were received and an architect was commissioned to design a suitable monument. A canopied stone structure was completed in 1844. It contained a life size figure of Grace with, appropriately, an oar laid at her side. Iron railings surrounded the monument. It was placed in an elevated position at the west end of the churchyard so it could be seen by passing ships. The material used was Portland stone. This was not a good choice; exposed to the elements of the North Sea, the monument soon weathered. Within a few years it proved necessary to rebuild it. 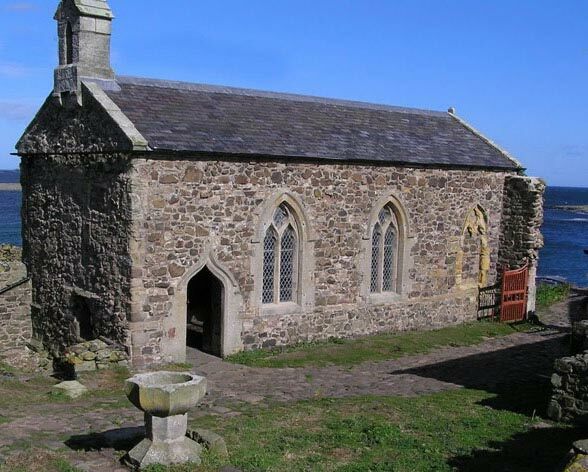 The Reverend A O Medd, the vicar of Bamburgh, helped raise funds and collected the required amount of £100 for its restoration in 1885. The replacement effigy was carved from Northumberland stone, donated by Lord Armstrong from his estate at Cragside. Then in 1893 a violent storm destroyed the canopied roof. The new canopy differs in design from the original, having a more elaborate, Gothic style. Therefore, St Aidan’s Church has two Grace Darling figures on display. The original weathered effigy of Grace was moved inside the church to protect it, and there it remains, opposite the south entrance door. Following the deaths of Thomasin and William, a Darling family plot was established twenty yards south of the memorial. It is enclosed by a low rail. This is where Grace is laid to rest and not, as many would suppose, in the grand memorial. She lies with her mother and father, brother Job and her beloved sister Thomasin. Upon her death there was another fund established to create a memorial to Grace, separate from the Bamburgh Church fund. This one received royal patronage. A small monastic cell on Inner Farne had once been the ancient home to St Cuthbert, who helped bring Christianity to these shores. It had fallen into disrepair. 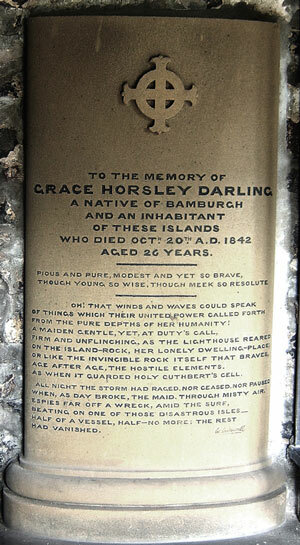 The plan was to restore it and to place within it a memorial inscription to Grace Darling. The proposal received strong support. Queen Victoria, who four years earlier had sent £50 to Grace, now sent £20 towards her memorial; the Queen’s mother, the Duchess of Kent, sent £10. Any original stonework that remained was re-used in the restoration, which was completed in 1848. Fittingly, the oak benches that were installed came from Durham Cathedral, the final resting place of St Cuthbert. Stained Glass Window, St Aidans.